So I mentioned it once before here, but because it was one of the best times in my life, I’m going to mention it again. During the year of 2008, I spent the months of September through December in Vienna, Austria (and a little bit elsewhere) living with an amazing Austrian family, learning the German language and learning about Austrian culture. I loved being there so much that I am always missing all of it with a little bit of my heart and I’m constantly trying to find ways to go back. Anyway, one of my many favorite memories while I was there was staying in the cutest little city called Dorfgastein. Now for me, Dorfgastein is the quintessential essence of Austria. We got to hike through the snowy alps while we were there (mind you I didn’t bring any hiking boots to Austria), watch some boys play fussball, eat breakfast in a little mountain cabin, and much more. A view of the town in the valley, from our hike in the Alps – a dream, isn’t it? But one of the things I remember most is going to mass on their Thanksgiving day. And although I am not catholic (read about my religion here) and my German was pretty pathetic, I could still feel a spirit there, and it was an amazing experience. And for our thanksgiving dinner we were fed traditional Austrian Wiener Schnitzel. I think it was veal. But it was delicious. 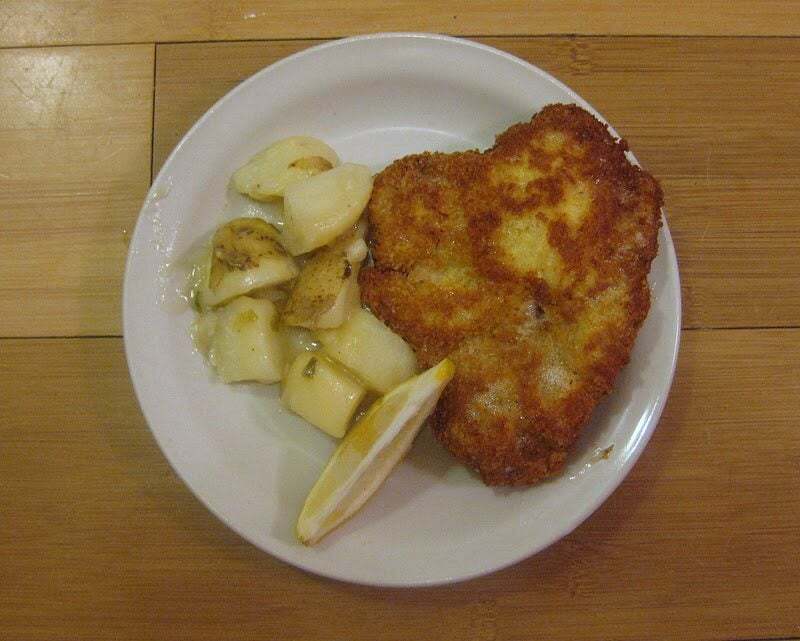 And since then schnitzel has always had a special place in my heart (or my stomach?) and I made it with a couple friends once when we got back to Utah, but my dear honey husband never tried it before, so finally I decided I needed to make it for him. And I used an Austrian cook book that was purchased in Vienna. And so this recipe is pure Austrian goodness. 1 lemon1. In a shallow large pan put about 1 inch of oil, and heat over medium low. 2. Beat each cutlet using a meat tenderizer or a heavy flat pan, between 2 pieces of plastic wrap until cutlets are about 1/4 inch thick. 3. Rinse the cutlets under cold water. 4. Dry with a paper towel. 5. Mix the flour with the salt and pepper in a small bowl. 6. Dip each cutlet into the flour mixture and cover completely. 7. In another bowl beat eggs. 8. In a third bowl combing Italian and Panko bread crumbs. 9. Dip each cutlet in the eggs and then cover in the bread crumbs. 10. Fry each cutlet in the oil for about 3 minutes on each side, until the breadcrumbs turn a golden brown color. 11. Cut lemon into wedges. 12. Serve each schnitzel with a lemon wedge. **If you want to make the meal more American, you can dip the schnitzel pieces into ketchup or another sauce instead. Either way, its delicious.